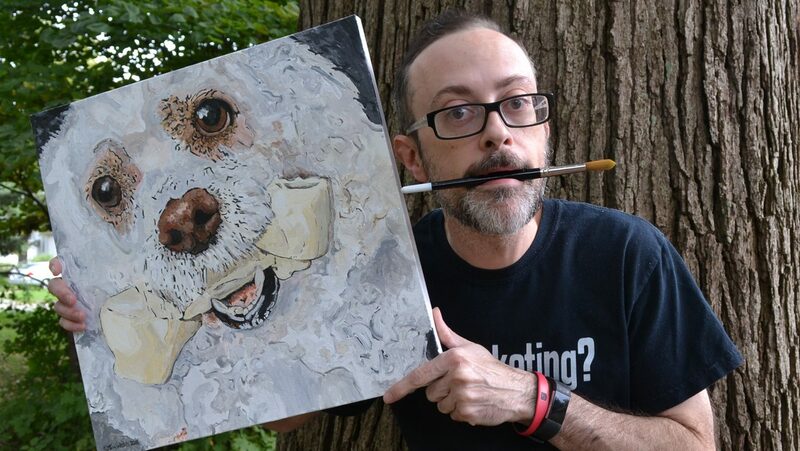 Who Else Wants to Discover the Joy of Having a Custom Handcrafted Portrait of A Favorite Furry Friend?! Go here to discover how to get yours right now! Here is the photo the above painting came from. As you can see it doesn’t have to be the best photo in the world. One from social media works fine as long as its not too dark or blurry. Unfortunately there isn’t a good photo of the painting of my friend Tom’s dog and it was many years ago that I painted it for him, but it’s still hanging on his wall at his house in Florida. or go here to get a FREE quote for your pet portrait booking now before someone else gets in line ahead of you (since these are booked on a first come first serve basis). The paintings typically take about 2 to 3 weeks to complete and range from $250 to $850 (depending on size and medium) so please hurry if you’d like to have it for Christmas. If we don’t get it done in time you can get a voucher to give to your loved one until the painting is completed. You’ll also get photos via email or social media of the work in progress! P.S. Pictured below are some more examples of what’s possible for your favorite furry friends!